Paul, the psychic octopus, has correctly predicted the results of all seven German games in the FIFA World Cup. And now he has decided that Spain will win over The Netherlands tonight and become World Champion. 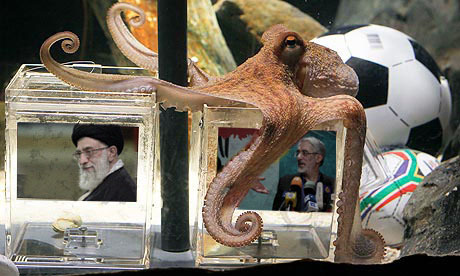 Thanks to that really talented octopus and enduringamerica.com we now know for sure that last year’s Iranian election was in fact rigged. Last update July 11, 2010. This entry was posted in humor, Iran and tagged Ali Khamenei, FIFA, Mir-Hossein Mousavi, Paul the octopus, psychic, soccer, South Africa, Spain, The Netherlands, World Cup. Bookmark the permalink.